View of the newly built iron bridge, which linked the Mansion House to the north of the River Thames with Southwark on the south. By the early 19th century it was clear that a new bridge was needed. 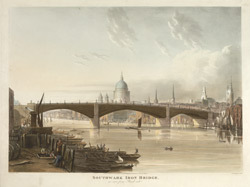 The project was planned by the Southwark Bridge Company which set up in 1813, although it was much opposed by those who believed a bridge at a narrow point would restrict the passage of ships. The bridge was designed by John Rennie, who chose a 3 arch bridge made of cast iron. It was built between 1814-19 and it impressed contemporaries as it was the largest cast iron bridge of its time.